Winter Wonderland Collection is full of gorgeous fantasy snow overlays and high quality Fine Art Textures. I'm pretty sure you will love to play with it. You can find long specification here. Please check additional previews as well. There is always many question about my editing, both here and my photography page, and here it is. If you enjoy my work, please feel free to share. Here is my RAW image. As always, first of all quick ''clean edit'', little more contrast and a little bit more light with the levels. Simply. There is no need to do anything else at this point. We would like to get this cold, clean look of the picture, so clean edit only, that's it ! 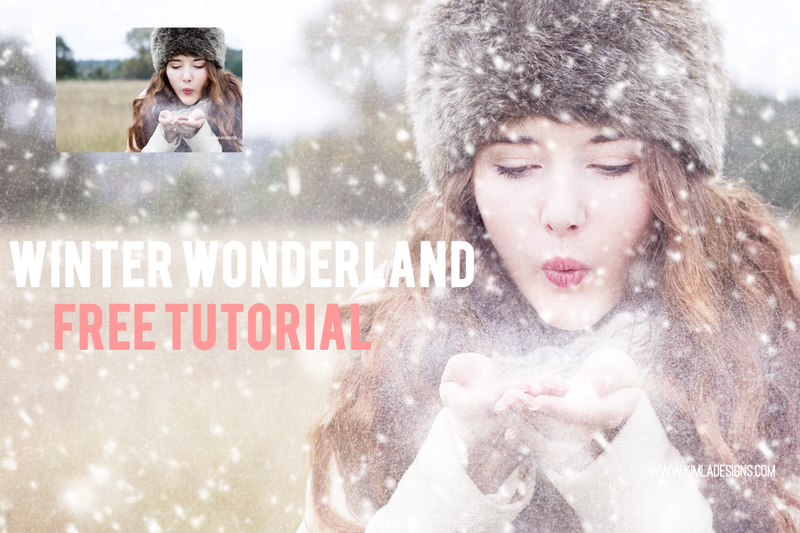 I run Winter Haze PS Action ( included in Winter Wonderland collection as a free bonus). I lower the opacity of the ''Purple Haze'' layer for 63%, but really you can tweak it to your taste. Here is how this pic looks like at this moment, there is more hazy winter light here, I quite like it, but still, this is not a Winter magic I have in my mind. Adding a Winter Glaze Textures. Here I picked Winter Glaze (13) & Winter Glaze (8) textures. Both on Screen mode and I lower the opacity of the first texture for 40%. As always try different looks, change the opacity for your taste. I used soft brush to erase some part of the textures over the face . Here is how this pic looks like after Winter Glaze work - some soft textures has been added.As I mentioned before, don't be affraid to try different glase textures, play with opacity, mix and match them. I placed Subtle Texture (2) over this pic layer with the Soft Mode and 59% opacity. Love this texture so much ! 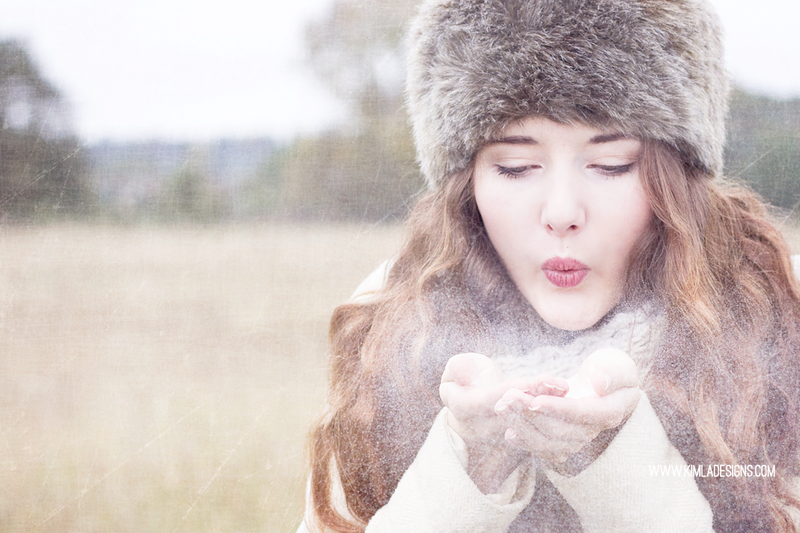 She has canvas/old painting look, so this is a little extra something for my winter picture! Do you see this little soft scratches around ? Love it. All these Fine Art Textures can be use not only with the winter pictures. The true is you can play with them many times. I'm sure there will look great with any floral art work or any kind of portraits. I will try to blog with few more examples later on. Snow, snow I need snow ! 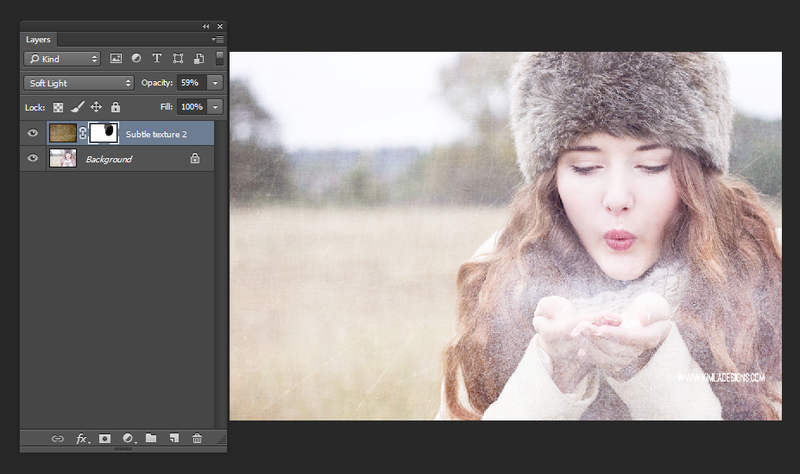 It will be super quick with our Snow Overlays! 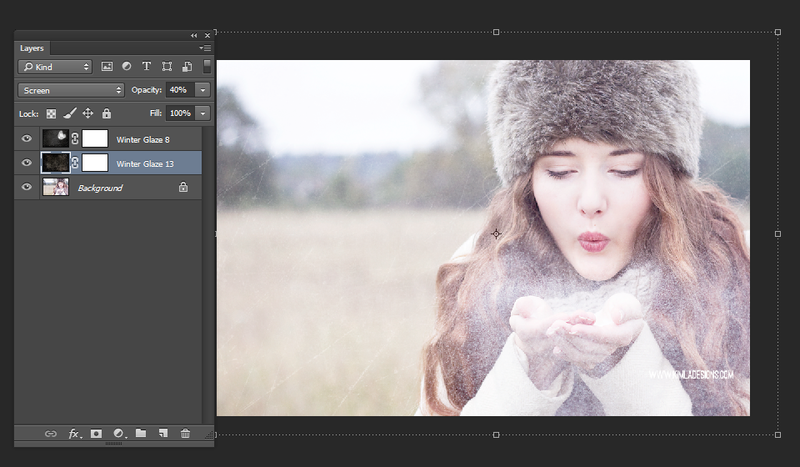 I picked Snow Overlay (8), place it over image layer with Mode ''Screen'' and that's it. There are over 20 Snow Overlays included in this collection, so you can pick your fav one, from little first snow to snow dust and heavy, flaky overlays. Have fun ! Here is my final pic. 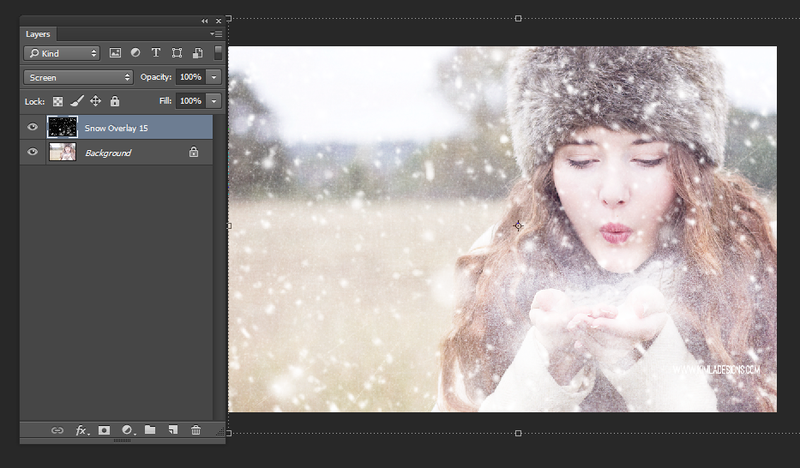 You can now resize and sharpen for the web and you are ready with your Winter Wonderland !